This is newlumen again. I ordered 8 of those button top from Richard. Thank you. I just measured my Maxtoch Mission M12 and Convoy L2 and both of them measured 26.9mm, so the Shockli should be good to go. @Shockli-Simon do you know of any retailers that sell your 5.500 mAh cells in Germany or support shipping there (like nkon in the Netherlands for example)? Thanks, Richard, we are happy to deal with you. thanks for the members in BLF’s support, we would like to provide good products to you. 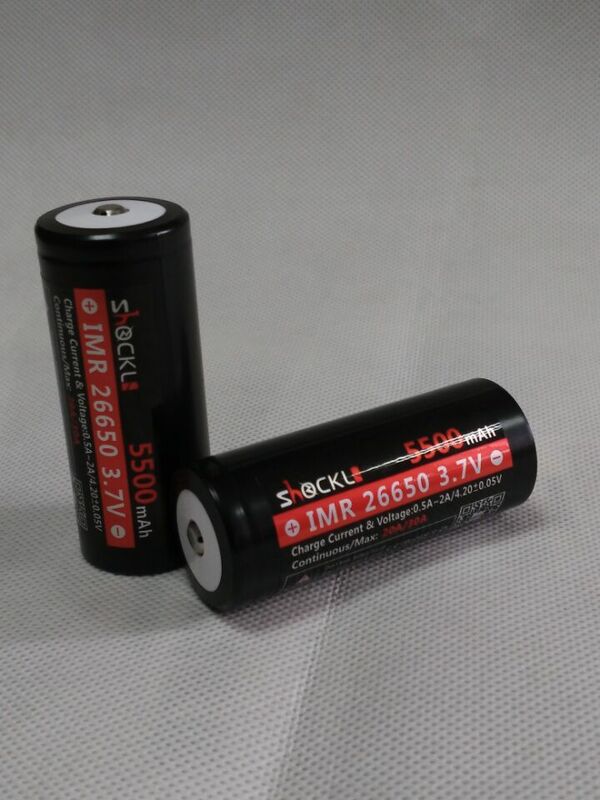 in addition, i want to correct that MTN Electronics carries the 3500mAh,4200mAh,and 5500mAh Shockli 26650 batteries, not 5200mAh batteries. Thanks for your share, Smittymojo. Hi, newlumen,thanks for your support of the Shockli battery,wish you satisfied with it. In addition. may you share what models of flashlight can use with Shockli 26650,5500mAh battery?thanks. welcome to discuss, in order the members can buy the right products. he can ship to Germany. thanks. Any idea how i can buy this in Australia? Orbtronic could have these at very good (budget) price (flat top), but the diameter 26.60-26.70mm is problematic. So guys what do you think about diameter? I think those I have at home (not home right now so can’t check) charged to around 5700mAh at 1A nor-test on my LiitoKala Lii-500 charger. I think it’s rated for 20A continues and 30A pulse. Can’t give you a link to it.. seems weird. I can’t find the product when using the browser but if I search for “26650-55A” on the app and filter on “number of orders” it’s right there on the top with 159 orders right at this point. I think those I have at home (not home right now so can’t check) charged to around 5700mAh-5800mAh at 1A nor-test on my LiitoKala Lii-500 charger. Depends what “better” means to you. Assuming the 55A is just a higher capacity version of the 50A, then it will have a larger voltage drop and lower capacity under high load than the Shockly, even though it has a few hundred mAh higher capacity. Personally I would go with higher discharge voltage and longer runtime under load instead of a few hundred mAh more capacity. I mean shockli could just have selected the cells from the top notch pile and sent to you. That why I wrote that 1 reviewer got 5922mAh on the LiitoKala 26650-55A and I got alittle lower. I don’t know the LiitoKala 26650-50A amp rating. But pretty sure the 55A is 20A continues and 30A pulse. And the shockli amp rating is the same. Shockli mAh rating is 5500mAh and I’m pretty sure the -55 at the end of the LiitoKala’s mean 5500mAh. So the ratings should be the same for both cells? I don’t know what the shockli cell cost but I think the LiitoKala’s 26650-55A is pretty cheap so I just wondering if someone knows if the shockli cell is superior or not, if I should go searching for these. The amp rating is not what matters. What matters is the real-world discharge tests under load. You can see in the tests I linked how the 50A has a much larger voltage drop under load, causing it to have less capacity than under 1A load. The 55A is just 500mAh higher capacity, which will change the voltage drop characteristics very little, it’s mostly just a capacity bump. The liitokala 50A actually has a slightly lower IR than the shockli 5500mAh cell, but the shockli holds a higher voltage for most of the discharge mostly because of its higher capacity. The liitokala 50A is the power long battery brand INR26650-50A. The liitokala 50B is probably from another manufacturer, but it has very similar performance (IR and capacity) as the 50A. The shockli 5500mAh cell is most likely the power long battery brand INR26650-55A. The liitokala 55A cell identity is unknown until it has been measured by a reliable source. I think I read someone on this forum tested it at ~5600mAh. It could be the power long battery INR26650-55A, or it could be something else. This is not true, the capacity difference is only 10%, but if you compare the 10A 50A and 15A Shockli discharge rates you will see that the shockli maintains almost the same voltage as the 50A, while proving 2,72C discharge compared to the 2C discharge of the 50A. 10% capacity increase but 36% C rate increase. On top of that, it gives almost 1000mAh more capacity at 15A. You will notice that the Shockli gives 5.75Ah at both 1A and 15A while the 50A actually decreases from 5.2 to 4.8Ah when going from 1A to 15A discharge. This is indication of a much higher quality cell with better current handling characteristics for the Shockli. I’m not saying the 50A is the better cell, but it does have a very slightly lower IR, defined as (V_opencircuit-V)/I. I agree with you though that the shockli is the better cell. Could? Where did you hear this and when will they have them? As of now they have 5200 protected and unprotected. I had the protected and sold them w/ a light. Possible problem with 5500 is diameter – almost 27mm. So it is a gamble. 5200 are within specs for 26650 dimensions. Orbtronic should have the first batch available by the end of this month if not earlier. How is this relevant to this topic about the Shockli 26650…? It probably is a killer price for the same PLB INR26650-55A cell, Enderman. Don't you wanted to build some big battery pack? Of course, it may be a risk before your eyes. There's just one test made of this cell, and it may well be a bit of a cherry pick. Just maybe…I can also understand Shockli may have asked and paid PLB for a cherry pick bin shipment. LoL! It probably is a killer price for the same PLB INR26650-55A cell, Enderman. Don’t you wanted to build some big battery pack? Of course, it may be a risk before your eyes. There’s just one test made of this cell, and it may well be a bit of a cherry pick. Just maybe…I can also understand Shockli may have asked and paid PLB for a cherry pick bin. LoL! Ah, it’s the exact same cell just with a different name? Are there any tests done on it to see if it’s exactly the same as the shockli? Nah man, stick with the Shockli, no guarantee such cell is the 55A, I only see blue and black 50A wraps among the product reviews. Wish AE sellers were more clear with their product ads. Mmm… maybe you should order a pack, to later file a claim/dispute because your cells have LiitoKala branded black wraps. If you win you would at least get some discount. I want my red Dolidada wraps, you @#$%! Barkuti have some good posts because it is pointing to the actual manufacturer (source) of these batteries. The red ones at least have the accurate part number. So we should call all these 5500mAh “Power Long” batteries I wouldn’t bother to change the wrap – probably it would be a lower price too. Hey! Remember you're taking a risk if buying these Dolidadas, please at least inquire the seller so you have a better picture (and better refund chances if the product isn't up to par). I like searching stuff and refining searches. Does someone makes protected Shockli 26650 IMR cells? I’m trying to sort out the mess with the top 26650 cells and fail…. 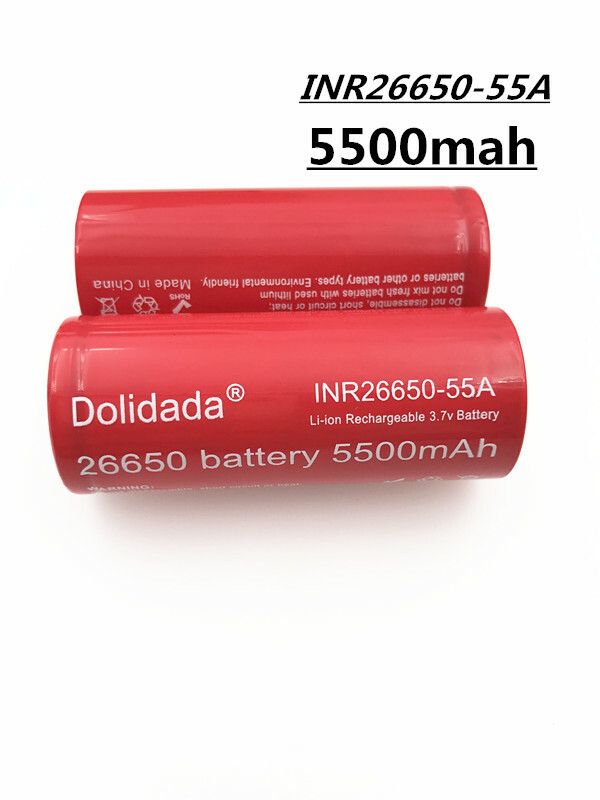 Dolidada 26650-55A and Liitokala 26650-55A have very similar name to PLB INR26650-55A, but different specs. And different from each other. Keeppowers have specced capacity matching what HKJ measured with Shockli. And IMR chemistry too. But slightly different size and weight. Agro, battery rewrappers are known to tamper with OEM manufacturer specifications. It does not matter how much, it is tampering anyway. This is probably done to ”protect” their OEM secrecy. LiitoKala is the “best” example in this business, as they do publicly list the OEM and model in their rewraps. IMR chemistry? Probably one of the very few true IMR cells is the LG HB6 and its brand siblings. And you can believe that if LG can't do more than 1.4Ah effective in a cell with less than half the volume of a 26650, the other manufacturers can't do much better if at all. Are all of them lying? No, but I'd say deception is their daily bread.